As I transferred my workouts from my log to my infographic for this past week, I paused to look closely and decided to take a moment to talk a little about how I fit so much activity into my days. My goal is always to inspire and show that I am very active and hope to be for a very long time. I do not ever want to make anyone feel badly should they compare their workouts to my own. We are not about comparing, we are about holding each other up. I’m a trainer and some of my workouts are with clients – walks, occasional runs, planks, etc. On to one of this week’s runs… Yesterday my friends and I had a very serious job. 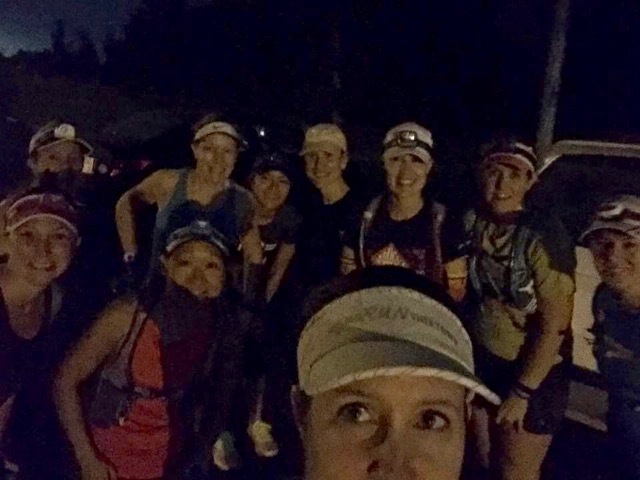 We met at 6 AM at our usual Saturday morning location with the job of keeping Erin calm and helping her manage the taper crazies before her Baltimore Marathon next weekend. Because of some recent calf pain, our favorite running doc told Erin to keep her pace at a 10:00 minute/mile for her eight-mile run. For the second week, we found ourselves running in rain and total darkness for the first half of our run. I didn’t bother taking my GoPro with me, but pulled it out after the run, and unfortunately, after all of our other friends had left. 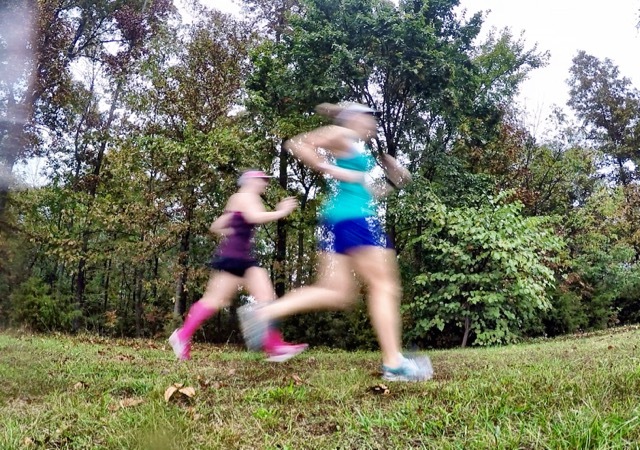 Erin and I had fun running back in forth in front of the GoPro since I wouldn’t let her do a jump shot – not the week before her big race, and certainly not with calf pain! Did Hurricane Matthew have any impact on where you live? I like how you state upfront what your situation is. Everyone’s situation and life responsibilities are different and I agree that we can’t compare. On that same note, I have a fully equipped gym at home too and there is no reason for me not to use it but I don’t. I pay to go to a gym because its less lonely and I guess in some way it hold me accountable! Everyones situation is so very different and that’s why I decided to point that all. In the past, I didn’t use my home gym nearly as much as I do now, but I used to be in a gym every day so I’d take advantage of down time and work out then. Sometimes I am reluctant to post my weekly workouts…we are all on our own journey! I do like to see what others are doing, tho! I like to see what others are doing to get ideas and inspiration. Thanks for sharing your workouts, and also for clarifying what your day-to-day life is like. We all have unique situations, and it’s so stupid to play the comparison game. I wrote a blog post awhile back about who we should be “competing” with, and it’s kind of a crap-shoot because none of us come from the same place, with exact circumstances (or abilities). I don’t have a fully-equipped gym, but I do have some hand weights, a yoga mat, and several pairs of running shoes (and a staircase!). I usually workout in the mornings. Two days a week the kids go off to school and I have the house to myself and those days I work out whenever I feel like it. Work days I try to get something in before work, even if it is only a 12 minute HIIT workout. My long runs happen when the kids are at school. I have some free weights, a rowing machine, an elliptical, yoga stuff and a kettlebell. Everything I need really. and lots of running shoes! It’s so important to find a routine that works for our individual schedules. I enjoy seeing your workouts each week and find it encouraging, not at all bragging. I wish I had a GoPro to take all the cool running shots. And good luck to Erin! Thank you! I love seeing what other are doing in their workouts, too. I find it very inspiring. Deb I love how active you are and never ever thought of them as anything but inspiring! It’s neat to take a look in others active women’s worlds to see how they do all fit it in. You do a great job. My trainer also does workouts with me on Leg Day mostly and I really like it when she joins me. If I want to know what muscles a exercise is supposed to work I just look at her doing them. You have me curious about this conference I can’t wait to hear more about it! Matthew didn’t affect our weather but I did check on a few of my FL friends and family! No racing but I stalked the Chicago from my lawn chair on Sunday morning cheering many of our blogging family on!!! I’m going to Club Industry in Chicago and I leave today! Wish I’d been there this past weekend to hang out with Holly and Wendy! It’s called an active lifestyle for a reason. 😉 And since you also have the wonderful opportunity to be a part of it from the training/teaching side, I expect your info-graphic to be wonderfully full! I hope your friend Erin has a wonderful marathon. I know you’ll be cheering loudly! Thanks for linking, Deb! HaHa – good point about my active lifestyle! I can’t wait to see how Erin does – fantastic, I’m sure! BTW, I can’t wait to hear how Chicago went for you. I arrived in Chicago today for my fitness conference. You and I came so close to being in the same city at the same time!